Citation: Partarrieu-Mejias F, Perez-Velasquez F, Alarcon-Cabrera R. Bleomycin-Induced Flagellate Dermatitis. Skin Dis Skin Care. 2016, 1:2. Copyright: © 2016 Partarrieu-Mejias F, et al. This is an open-access article distributed under the terms of the Creative Commons Attribution License, which permits unrestricted use, distribution, and reproduction in any medium, provided the original author and source are credited. The skin is one of the most commonly affected organs by chemotherapeutic agents, with a wide array of clinical manifestations that vary depending on the used drug. Flagellate Dermatitis (FD) is a cutaneous eruption with a characteristic whip-like appearance classically related to the use of bleomycin, a cytotoxic drug used in different schemes of cancer therapy. We present an illustrative case of this specific and rare drug-related entity. A 43-year old female, recently diagnosed with classical Hodgkin’s disease Stage IVB, developed a linear erythematous and pruriginous eruption on her lower limbs 15 days after her first cycle of doxorubicin, bleomycin, vincristine and dacarbazine (ABVD) chemotherapy. Initially thought to be fungal lesions, they were treated with topical clotrimazole for several weeks, without clinical response. The lesions began to extend on the following weeks, which prompted a referral to the dermatology clinic after completing six cycles of chemotherapy, having received a total dose of 192 Units (U) of bleomycin. She denied any systemic symptoms at the time. Physical examination revealed an extensive red-toviolaceous excoriated rash with a striking linear configuration that affected her shoulders, dorsum, neck (Figure 1), hands, thighs, calves and ankles (Figure 2) alongside brownish linear macules consistent with post-inflammatory hyperpigmentation. The clinical findings and the previous use of bleomycin raised the diagnosis of Flagellate Dermatitis. Figure 1: Erythematous striking linear lesions on the side of the neck. Figure 2: Brownish-red linear papules on the dorsum of the hands, thighs and calves. No biopsy specimen was obtained. Topical hydrocortisone cream three times per day in itchy areas was prescribed. A month later, the inflammatory lesions settled leaving residual hyperpigmentation. There was no recurrence at 6 months follow-up. Bleomycin is a glycopeptide-related cytotoxic agent used to treat different kinds of cancer, such as squamous cell carcinoma, lymphomas, testicular carcinoma and malignant pleural effusion . It is also used by dermatologists to treat recalcitrant warts, hypertrophic scars and keloid . Its clinical use is limited nowadays due to its several side effects: pulmonary fibrosis, Raynaud's phenomenon, alopecia, nail dystrophy, gangrene, edema and a specific type of dermatitis called"flagellate dermatitis" . This entity  was named after the typical shape of its presentation, derivative from the latin term flagellum. It is considered to be a rare side effect of bleomycin treatment that can be seen, depending on the series, in 8-66% of patients receiving the drug [1,3]. It is relatively unusual in adults and very rare in children . It can appear 12-24 h to six months after the initial exposure to bleomycin . The skin, as the lungs, lacks bleomycin hydrolase, an inactivating enzyme to the drug [1,3] which explains the cutaneous toxicity to bleomycin. FD is considered to be a dose-dependent reaction and normally occurs at total doses over 100 U and very frequently at doses over 200 U3. However, it can also occur after doses as low as 14-15 U, especially in female patients [1,4]. FD usually presents as erythematous, lineal, intermingled streaks forming roes and adjoining firm papules. Although the lesions lack a characteristic distribution, they frequently appear in bony prominences , trunk and extremities [6,7]. Usually they evolve with a decrease in erythema with the affected areas becoming deeply pigmented [5,7]. Most cases are preceded by a prodrome of generalized pruritus, although a few reports describe the lesions as nonpruritic . The precise etiology of FD remains unclear [1,5]. Localized increase in melanogenesis, pigmentary incontinence, secondary inflammation, alteration in normal pigmentation patterns and toxic effects of the drug itself  are some of the existing hypotheses. The most common configuration of the lesions suggests a relationship with scratching, a very common symptom in lymphoma, and the disease. A proposed mechanism is the leakage of bleomycin facilitated by scratching and subsequent dermal accumulation [3,5]. However, attempts to reproduce lesions by this mechanism have generally been unsuccessful . Histopathological findings in FD are varied, including spongiotic dermatitis, full thickness epidermal acantholysis, liquefaction of the basal layer with hyperpigmentation and melanin pigmentation in the stratum corneum . Findings differ depending on the stage of evolution of skin lesions and the biopsy site . Differential diagnoses include dermatomyositis, adult-onset Still disease in HIV infection and, classically, shiitake mushroom intake [3,6]. The latter will present initially with pruritic papules and vesicles that develop on the face, scalp, trunk and proximal extremities; the scratching of these lesions lead to long flagellate papular or petechial streaks , finally followed by linear patterns that do not leave postinflammatory hyperpigmentation [1,6]. The typical lesions plus a history of previous bleomycin use make the final diagnosis . More commonly, lesions are self-limiting and tend to disappear after bleomycin is suspended. Postinflammatory hyperpigmentation is usually reversible but may take 3-4 months to fade . Permanent hyperpigmentation in the affected areas is not uncommon . There is no effective treatment for FD [1,3]. Topical corticosteroids have shown improvement in attenuating hyperpigmentation and antihistamines are used to ease pruritus [4,5]. Lesions can recur upon reexposure, which can result in a more severe reaction . The drug should be discontinued if a severe rash appears, at the same time assuring that this decision would not endanger the patient’s response and success to chemotherapy . In conclusion, FD is a relatively uncommon but unique side effect to the use of bleomycin as treatment for cancer, which is seen in an increasingly infrequent way nowadays due to the declining use of the drug. It becomes relevant for the physician to be aware of this toxic drug reaction and recognize its nature, extension and severity, in order to decide whether to continue or stop administrating the drug. We would like to thank the patient for granting permission to publish this information. She waived her right to read a copy of the manuscript before submission. There were no sponsors or funding organizations involved in this project. This means that the study design; collection, analysis, and interpretation of data; writing of the paper; and decision to submit it for publication were all performed by the authors mentioned above. None of the authors have any conflict of interest to disclose for this manuscript. Yamamoto T (2006) Bleomycin and the skin. Brit J Dermatol 155: 869-875. Moulin G, Fiere B, Veyvin A (1970)Cutaneous pigmentation caused by bleomycin. Bull SocFr Dermatol Syphiligr 77: 293-296. Brazzelli B, Brarruscotti S, Calafiore L,Zecca M, Borroni G, et al. (2014) Bleomycin-induced flagellate dermatitis. Report of four pediatric cases. J Eur Acad Dermatol Venereol 28: 669-675. Ziemer M, Goetze S, Juhasz K, Elsner P (2011)Flagellate Dermatitis as a Bleomycin-specific adverse effect of cytostatic therapy: A Clinical-Histopathologic correlation. Am J Clin Dermatol 12: 68-76. Biswas A, Chaudhari PB, Sharma P, Singh L, Julka PK, et al. (2013) Bleomycin induced flagellate erythema: Revisiting a unique complication. J Can Res 9: 500-503. Reyes-Habito CM, Roh EK (2014) Cutaneous reactions to chemotherapeutic drugs and targeted therapies for cancer. Part I: Conventional chemotherapeutic agents. J Am Acad Dermatol 71: 203.e1-203.e12. 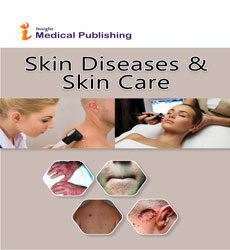 Bolognia JL, Schaffer JV, Duncan KO,Ko CJ (2014) Dermatol ogy Essentials (1st edn.) Philadelphia: Saunders-Elsevier. Guillet G, Guillet MH, de Meaux H, Gauthier Y, Sureve-Baseille JE, et al. (1986) Cutaneous pigmented stripes and bleomycin treatment. Arch Dermatol 122: 381-382. Chen YB, Rahemtullah A, Breeden E, et al. (2007) Bleomycin-induced flagellate erythema. J Clin Oncol 25: 898-900.